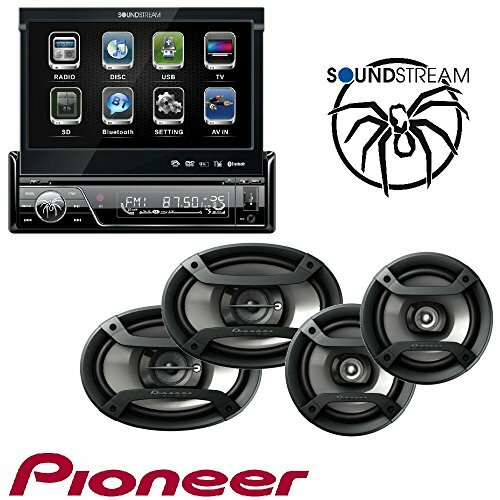 View More In Car Stereo Receivers. Measurements : 6" x 9"
Soundstream 7 Single DIN Flip Out Touch Screen DVD, USB, SD Bluetooth 2.0 Built-In, USB, SD Card, MP3, DVD, LED. Backlighting Single DIN In Dash. Motorized 7 LCD Screen with Angle Adjustment. Detachable theft deterrent front panel Touch screen. Playback from DVD, DVD-R/RW, CDR/RW, VCD, MP3 ,MP4, DivX Recall memory from last DVD position. If you have any questions about this product by Cache, Soundstream, Pioneer, contact us by completing and submitting the form below. If you are looking for a specif part number, please include it with your message.